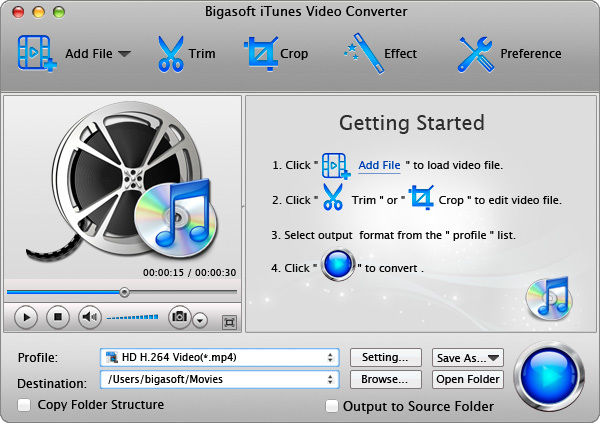 Bigasoft iTunes Converter for Mac can convert a variety video formats including AVI, MKV, MPEG, Xvid, DivX, H.264, 3GP, WMV, FLV, MOD, TOD, WTV, WebM, F4V, BIK, M4B, 720p, 1080p, 1080i HD, AVCHD to iTunes compatible video MP4, MOV, M4V and iTunes Music MP3, M4A, AAC, AIFF. So you can easily import AVI to iTunes, WMV to iTunes, FLV to iTunes, MKV to iTunes and more format video to iTunes on Mac OS X. Key features: 1. Preset ready quality video for Apple devices Bigasoft Mac iTunes Converter presets profiles for all types of Apple devices including iPod classic, iPod nano, iPod shuffle, iPod touch, iPod touch 4, iPhone, iPhone 3G/3GS, iPhone 4, iPad, iPad 2 and Apple TV. If your aim is to import video to iTunes to sync to iPod, iPhone, iPad and Apple TV to enjoy on the go, the optimized video will provide perfect solution for you to lightly transfer videos to portable devices and enjoy high quality video on the go. 2. Provide better user experience by providing batch conversion, add file via folder and output converted video to source video and many more. - Support output video to source folder for easily find converted videos. 3. Easily trim, crop and merge videos 4. Adjust video brightness, contrast and saturation, and add text and image water mark to output video. 5. Allow advanced settings including adjust video size, video bitrates, resolution and aspect ratio, increase or decrease video volume, delete audio track and more. 6. Easy-to-use 7. Supports multi-tasking, multi-core CPU processing and multithreading which accelerates the conversion 2X faster. 8. Provides multi-languages including English, German, French, Spanish, Italian, Japanese, Arabic, and Chinese. 10. Highly compatible with Mac OS X 10.4(Tiger), 10.5(Leopard), 10.6(Snow Leopard), 10.7(OS X Lion), 10.8(Mountain Lion), and 10.9(Mavericks). Aiseesoft AVI Video Converter ist professioneller und hervorragender AVI Converter, der FLV in AVI konvertieren, WMV in AVI konvertieren, MOV zu AVI konvertieren, MPEG in AVI konvertieren, und andere Videos in AVI konvertieren kann. 3GP Video Converter Free is easy-to-use 3GP convert tool designed for mobile phone user. With our free video to 3gp converter, you can convert batches of videos to 3gp & 3g2 formats playable on any mobile phone. Download 3GP video converter FREE now! Dedicated WMA Converter for Mac, convert WMA to AVI,FLV, MPEG, VCD, SVCD, DVD, 3GP, iPod Mp4, PSP MP4, MP4 format and to your iPod, iPhone, iTouch, PSP, PS3 and other digital devices. Support converting video file to WMA and batch conversion. This site does not contain serial number, crack, keygen Bigasoft iTunes Video Converter for Mac serial number : serial number is the simplest type of crack. A serial number(cdkey,product key,etc) is register the program as you may already know. a crack or keygen may contain harmful software. If you cannot find the exact version you want, just give it a try. for more information read .nfo/.txt/.diz file include in zipped file.